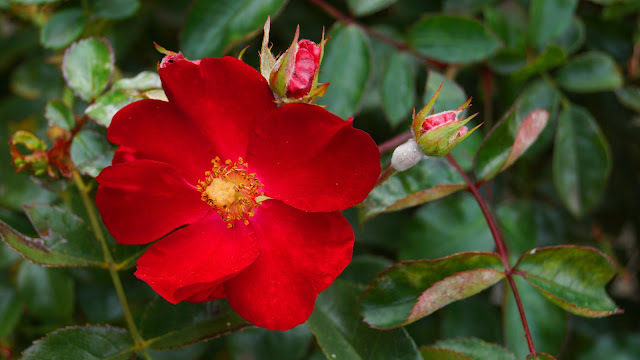 Rosa 'Home Run' (Home Run® Rosa x 'WEKcisbako' USPP 18,552) is easily the best true-red rose with continuous blooms and top level disease resistance to both black spot and powdery mildew. It has a high level of tolerance to downy mildew as well. Plus it's heat tolerant, cold hardy and requires no deadheading. It prefers full sun, and will grow to 1-1.5 metres in height and width in your landscape. It is hardy in zones 4-9 and will bring wonderful colour to your garden for years. You still have time to plant it this autumn, trim to shape comes spring, then simply sit back and enjoy. Like its father (Knock Out), Home Run has excellent resistance to black spot. Unlike Knock Out, Home Run is also completely resistant to powdery mildew and has a higher level of tolerance to downy mildew as well. It is a useful in mass plantings and mixed borders. A very low-maintenance yet colourful plant for sunny areas. Little care is needed, with a trim to shape in spring, and application of a controlled release fertiliser. This rose does not need deadheading or winter protection. Prefers moist, well-drained soil. Add your own Flower photos on the linky list below and please visit other people's blogs to see their contributions. I appreciate your linking up and enjoy personally seeing your great photos, however, due to a work-related busy time I may have not commented lately - I shall endeavour to do so ASAP! so beautiful! I love roses! That rose is so real I can almost smell its fragrance. I would love to take part in this blog hop - once the A to Z challenge is over. Do you visit ieach other and comment? Nick, vibrant color. Thanks for sharing. It looks like a hedgehog, which I only know in pink and white and a little reddish. In this red I have never seen her. She looks wonderful! Beautiful! My camera has a tough time capturing red petals. A really wonderful rose with fantastic and salient features. I love the single flower roses from Tom Carruth!